本发明公开了一种基于非光滑观测器的含有死区和迟滞的复合三明治系统状态估计方法，首先利用关键项分离原则和切换函数，由简单到复杂，借鉴已构建的带死区、带间隙和带迟滞三明治系统非光滑状态空间方程，构建能准确描述含有死区和迟滞的复合三明治系统的非光滑状态空间方程；其次根据构建的复合非光滑三明治状态空间方程，当系统满足观测器的存在性条件时，构造能随复合非光滑三明治系统工作区间变化而自动切换的非光滑状态估计观测器。 The present invention discloses a method based on a non-smooth observer and a composite sandwich comprising dead state estimation method hysteresis, using the first key-separation principle and switching functions, from simple to complex, with reference dead zone has been constructed with a gap and with hysteresis sandwich nonsmooth state space equations constructed accurately describes the non-smooth state space equations containing the dead zone and the composite sandwich system hysteresis; second composite nonsmooth sandwich state space equations constructed, when the system satisfies observer is present when the condition, the non-smooth state can be configured to automatically switch section changes with the operating system Nonsmooth sandwich estimation observer. 本方法的优点是：通过引入切换函数更准确地描述该类系统；公开的复合非光滑观测器能够随系统工作区间的切换而自动切换；与传统的观测器比较，采用本方法的观测器能更准确地估计系统的状态值。 Advantage of this method are: a more accurate description of such systems by introducing a switching function; Nonsmooth disclosed observer system capable of working with the switching section automatically switches; compared with the conventional observer, the observer using the present method can a more accurate estimate of system status values. 本发明属于非线性系统的状态估计领域，特别涉及一种基于非光滑观测器的含有死区和迟滞的复合三明治系统状态估计方法。  The present invention pertains to nonlinear system state estimation, and in particular relates to composite sandwich system based on non-smooth observer comprises dead zone and hysteresis state estimation methods. 对于任何控制系统来说，无论是实现系统的闭环极点配置，还是实现系统的解耦都离不开状态反馈。  For any control system, whether the system is a closed loop pole placement to achieve, or to achieve decoupling system status feedback can not be separated. 同时，准确估计系统的状态也是实现系统最优控制和故障诊断的重要依据。 At the same time, an accurate estimate of the state of the system is an important basis for optimal control and fault diagnosis system implementation. 然而，系统的状态并不都是易于直接能检测到的，有些状态变量甚至根本无法检测至IJ。 However, the state of the system is not always easy to be detected directly, and some state variables or even impossible to detect IJ. 因此，研究者常常通过构造状态观测器来解决以上问题。 Therefore, the researchers are often used to solve this problem by constructing state observer. 但是，对于特定系统，如果不根据系统实际情况构造观测器进行状态估计，必将导致状态估计的不准确。 However, for a particular system, if the observer is not configured according to the actual system state estimation, state estimation will lead to inaccuracies. 依据不准确的估计状态无法实现对系统的准确控制，在故障诊断中，不准确的状态估计也会导致故障的误报和漏报。 Based on inaccurate estimates the state can not achieve accurate control of the system, fault diagnosis, inaccurate state is also expected to lead to failure of false positives and false negatives. 因此，构建能准确估计特定系统状态的状态估计观测器和能够实现准确故障预报的故障预报观测器显得尤为重要。 Therefore, the construction can accurately estimate the state of a particular system state estimation observer and the failure to achieve accurate forecasts fault prediction observer is very important. 死区、间隙和迟滞是最常见的非光滑非线性特性。  the dead, and hysteresis gap is the most common non-smooth nonlinear characteristics. 死区广泛存在于直流电机，机械传动系统、液压传动系统、机电一体化系统和功放电路系统中。 Dead widespread in the DC motor, mechanical drive system, hydraulic system, and a power amplifier circuit mechatronic systems systems. 间隙广泛存在于齿轮机械传动系统、电动阀、数字电路、传感器和液压系统中。 Gap widespread in gear mechanical transmission, electric valves, digital circuitry, sensors and hydraulic systems. 近年来，采用记忆合金、压电陶瓷的智能执行装置由于具有定位精度高、驱动力大和响应快等优点，被广泛应用在精密加工机床、航天飞机的柔性机械手臂和天文望远镜等精密设备的定位系统中，但是记忆合金和压电陶瓷中存在着迟滞这种非光滑非线性，因此，迟滞广泛存在于精密加工机床、航天飞机的柔性机械手臂和天文望远镜等精密设备的定位系统中。 In recent years, the use of shape memory alloy, piezoelectric ceramic intelligent execution apparatus due to its high positioning accuracy and response to the driving force and the like, are widely used in the positioning precision machine tools, the shuttle and flexible mechanical arm telescopes and other precision equipment system, but memory alloy and a piezoelectric ceramic exists in this non-smooth hysteresis non-linearity, hysteresis exists widely in precision machine tools, the positioning system of the shuttle and flexible mechanical arm telescopes and other precision devices. 另外，通信系统中常用的射频电路和锁相环路也包含有迟滞三明治系统。 Further, the communication system commonly used in RF circuits and phase-locked loop system also contains hysteresis sandwich. 而在工程实际中，死区、间隙和迟滞非线性特性往往不是孤立的，而是与其他传统环节相联接，夹在两个线性动态环节之间，被称为非光滑三明治系统。 In engineering practice, the dead zone, the nonlinear characteristic and hysteresis gap is often not isolated, but coupled with other conventional aspects, sandwiched between two linear dynamic links, known as non-smooth sandwich system. 带死区、间隙和迟滞的非光滑三明治系统可统一用图1所示的结构框图来描述。 Dead band gap and hysteresis nonsmooth sandwich system may be described in a unified structure of the block diagram shown in FIG. 1. 但是，在实际的工程中，很多系统并非是如图1所示的典型非光滑三明治系统，例如，一个柔性机械手臂由放大电路、直流电机、压电陶瓷和机器手臂的执行机构组成，同样放大电路可以看作一个线性环节Ll，直流电机存在死区看作一个死区环节DZ，压电陶瓷存在迟滞特性可以看作一个迟滞环节HS，最后，机器手臂的执行机构可以看作是一个线性环节L2。  However, in the actual project, as shown in many systems is not a typical sandwich nonsmooth system shown in, for example, a flexible mechanical arm by the amplifying circuit, the DC motor, the actuator and the piezoelectric ceramic composition of the robot arm , the same circuit can be regarded as a linear amplifying part Ll, there is a dead zone as a part of the dead zone DZ, the presence of hysteresis characteristics of piezoelectric ceramics can be regarded as a part of HS hysteresis motor, and finally, the robotic arm can be regarded as actuators a linear link L2. 因此，整个系统可以表示为图2所示的结构，它的非光滑环节由一个死区串联一个迟滞组成。 Thus, the entire system may be represented as the structure shown in FIG. 2, it consists of a series link nonsmooth dead zone composed of a hysteresis. 为此，本发明定义了一类新的非光滑三明治系统：如果非光滑三明治系统的中间环节不止一个，而是多个非光滑环节串联在一起，这样的非光滑三明治系统称作复合非光滑三明治系统，图2所示的系统就是含有死区和迟滞的复合三明治系统。  To this end, the present invention defines a new class of non-smooth sandwich system: If the middle part of the sandwich system nonsmooth just one, but a plurality of links connected in series with a non-smooth, non-smooth so called sandwich complex system nonsmooth sandwich system, the system shown in FIG. 2 is a composite containing a dead zone and hysteresis sandwich system. 针对特定系统构造相应的观测器一直都是控制工程领域的一个研究热点。  for a particular system configuration corresponding observer control engineering has been a hot topic. 自DJ Luenberger (1971)在本世纪70年代提出著名的Luenberger观测器以来，对于定常线性系统观测器的设计理论和方法就已成熟。 Since DJ Luenberger (1971) made his famous Luenberger observer since the 1970s, the design theory and methods of linear time-invariant systems Observer already mature. 但对于非线性系统却不同，首先，非线性系统的能观性是一个局部特性;第二，线性系统的能观性与系统输入无关，只取决于系统本身的结构，而非线性系统的能观性不但与系统结构有关，同时还与系统输入有关。 But for nonlinear systems is different, first, the observability of the nonlinear system is a local characteristic; second, linear system observability of the system independent of the input, only depending on the structure of the system itself, and nonlinear systems can and observability of the system structure only, but also related to the system input. 正是由于非线性系统的复杂性，对于非线性系统我们很难找到一个统一的观测器构造方法，往往是针对某一类非线性系统构造一类特定的观测器。 Because of the complexity of nonlinear systems, nonlinear systems is difficult to find a unified constructor observer, often construct a particular kind of observer for a class of nonlinear systems. 在特殊系统观测器设计方面，马克茂，马萍(2003)对满足Lipschitz条件的非线性系统开展了观测器设计研究。  In the design of special observer system, Side Jet, Ma Ping (2003) for nonlinear systems with Lipschitz condition to carry out the design studies observer. 朱芳来(2004)对类Lyapunov非线性系统设计了降维观测器进行状态估计。 Zhu Fang to the (2004) class of nonlinear systems designed Lyapunov dimension reduction observer state estimation. 周少武，章兢(2001)提出一种改进的Lipschitz非线性系统观测器的设计方法。 Zhou Shaowu, Zhang Jing (2001) proposed an improved design method Lipschitz nonlinear systems observer. 栾小丽等（2008)构造了非线性不确定时滞系统的观测器，利用该观测器对该类系统进行鲁棒控制。 Luan Mary et al. (2008) constructed a nonlinear uncertain systems observer, of the type with which the observer robust control system. 韩春艳等（2009)针对随机时滞系统构建特定观测器进行状态估计。 Han Chunyan et al. 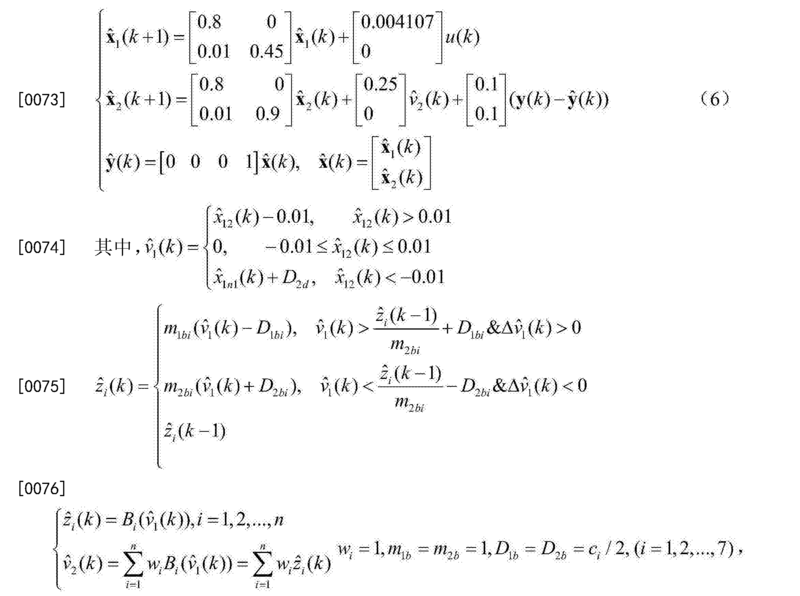 (2009) Construction of a particular observer stochastic delay for system state estimation. 吴敏等(2008)完成了含不可观变迀事件图的状态估计器设计。 Wu Min, etc. (2008) completed the event with no appreciable change Gan map of the state estimator design. A. Lj . Juloski .等(2002，2003)针对分段线性系统设id种Luenberger型切换观测器进行状态估计。 A. Lj. Juloski. Et al. (2002, 2003) id disposed species Luenberger observer type switch for piecewise linear system state estimation. A.Alessandri等(2001)利用共用Lyapunov函数方法求解分段线性切换系统的观测器增益矩阵。 A.Alessandri et al (2001) using a common Lyapunov function for solving a system of switching piecewise linear observer gain matrix. 周祖鹏，谭永红(2011，2012)对单一的带死区、间隙和迟滞三明治系统设计了非光滑观测器进行了状态估计。 ENGINEERING OF Tan Yonghong (2011,2012) with single dead zone and hysteresis gap sandwich system design nonsmooth state estimation observer is carried out. 但是，以上状态估计方法都是针对特定系统开展观测器设计，在这些方法中都假设系统是完全能观的或是给定只有一个非光滑环节，而复合非光滑三明治系统在某工作区间不完全能观且具有两个串联的非光滑环节。  However, the above methods are to carry out state estimation observer design for a particular system, in these methods assume that the system is completely observable, or given only a part of the non-smooth, non-smooth and complex systems work in a sandwich concept of incomplete section and having a non-smooth part of two series-connected. 因此，在对复合非光滑三明治系统进行状态估计观测器设计时，必须同时要考虑系统不完全能观和复合后的新问题。 Therefore, when the Nonsmooth sandwich system state estimation observer must be designed taking into account new problems after the system is not completely observable and complex. 因此，本发明将拓展复杂系统状态观测器理论，解决含有死区和迟滞的复合三明治系统状态变量的准确状态估计问题，本发明具有一定的科学理论意义与实际应用前景。 Accordingly, the present invention will expand the state observer theory of complex systems to solve the problem of containing an accurate estimate of the state of the dead and composite sandwich sluggish system state variables, the present invention has a certain theoretical science and practical application. 针对上述技术的不足，本发明公开了一种基于非光滑观测器的针对含有死区和迟滞的复合三明治系统的状态估计方法，与带死区，带间隙和带迟滞的单一非光滑三明治系统比较，采用该方法能解决单一非光滑观测器无法解决的复合问题，与传统的观测器比较， 采用该方法的观测器能更准确地估计系统的状态值。  For less than the above techniques, the present invention discloses a method for estimating, for the dead band and dead state containing composite sandwich system based on the hysteresis nonsmooth observer, smooth band gap and a single non-hysteretic sandwich comparison, this method can solve the problem of a single composite nonsmooth observer can not be solved, compared with the conventional observer, the observer using this method can more accurately estimate the value of the state of the system. 步骤2:根据步骤1构建的复合非光滑三明治状态空间方程，当系统满足观测器的存在性条件时，构造能随复合非光滑三明治系统工作区间变化而自动切换的非光滑状态估计观测器，并给出相应非光滑状态估计观测器的存在条件和收敛性定理。  Step 2: According to step Nonsmooth sandwich state space equations constructed 1, when there is a condition observer system meets the non-smooth state configuration can be automatically switched with the operating section changes Nonsmooth Sandwich estimated observed , a non-smooth and the corresponding presence state estimation observer and convergence Theorem. 1，2，Xll和X2l分别代表前段线性环节和后端线性环节的第i个状态变量；4 e 是状态转移矩阵，是输入矩阵，yieRlxl是输出变量，m表示第i个线性子系统的维数，ue Rlxl是输入变量，V1eRlxl是迟滞的输入变量同时也是死区的输出变量，V2GRlxl是迟滞的输出变量。 1,2, Xll and X2l represent linear anterior part and a rear part of the i-th linear state variables; 4 e is a state transition matrix, input matrix, yieRlxl output variable, m denotes the i-th dimensional linear subsystem number, ue Rlxl input variables, V1eRlxl output variable hysteresis input variables is also dead zone, V2GRlxl is a hysteresis of output variables. 21 (k)是第i个间隙的输出，Wl是第i个间隙在构成迟滞中所占的权重，B1 (□)是单个间隙的输入输出函数，η用来构建迟滞的间隙的个数;Hllb是间隙的斜率，HUd是死区的斜率;Dlb是间隙的宽度，Dld是死区的宽度。 21 (k) is the i-th output gap, Wl is the weight percentage of the i-th constituting the hysteresis gap heavy, B1 (□) is a function of the input and output of the single gap, η hysteresis number for building a gap; Hllb is the slope of the gap, HUd is the slope of the dead zone; Dlb width of the gap is, Dld is the width of the dead zone. 定理:对于满足以上三个假设条件的含有死区和迟滞的复合三明治系统，可以构造如式（5)所示的观测器对该系统进行状态估计，如果选择观测器的反馈矩阵心，使得(A2-K2C22)的特征值均在单位圆内，那么式（5)所示的观测器的估计误差最终会收敛到零，其中，A2表示后端线性系统的转移矩阵，K2表示后端线性系统的反馈矩阵，C22表示后端线性系统的输出矩阵。  Theorem: to meet the above assumptions and a compound containing a dead zone hysteresis sandwich system, can be configured as shown in (5) of the observer of the system state estimation, if the selected matrix heart FEEDBACK such that (A2-K2C22) eigenvalues ​​are within the unit circle, then the estimated error shown in the formula (5) observer will eventually converge to zero, wherein, A2 represents a linear transfer matrix backend system, K2 a rear terminal linear feedback matrix systems, C22 represents a linear output matrix backend system. 1.充分考虑了死区和迟滞的非线性和非光滑特性和两种的串联复合特性，通过在复合三明治系统中，引入切换函数更准确地描述该类系统，通过复合函数公式⑷建立了其准确的数学模型以描述该类系统，公式⑷把死区和迟滞非光滑特性连接在一起，解决了如何准确描述复合三明治的难题。  1. The full consideration of dead time and nonlinear characteristics and the smooth and non-complex series of two hysteresis characteristics, such systems are more accurately described by the composite sandwich system, switching function is introduced by a composite function formula ⑷ It established its exact mathematical model to describe the class system, the formula ⑷ put together deadband and hysteresis characteristics of non-smooth, accurate description of how to solve the complex problem of sandwiches. 2.在构建的系统的准确数学模型的基础上，构造复合非光滑状态观测器估计其状态值，其中复合非光滑观测器能够随系统工作区间的切换而自动切换，特别是公式(5)中包含了连接两个非光滑环节的复合表达关系，成功地解决了复合非光滑三明治系统状态观测器的构建难题，并给出了该类系统状态观测器的存在条件和收敛性定理。  2. On the basis of an accurate mathematical model of the system constructed on the construction of the composite non-smooth state observer estimates the state value, wherein the composite nonsmooth observer can be automatically switched with the switching system working range, particularly the formula ( 5) comprises two connecting links nonsmooth complex relationships expressed successfully solved Nonsmooth state observer system sandwich construction problems, given the presence of such systems and the state observer convergence theorem. 3.与单一的带死区，带间隙，带迟滞的非光滑三明治非光滑观测器比较，构造的复合非光滑三明治系统成功地解决了多个非光滑环节串联的状态估计问题，这是过去方法无法解决的。  3. A single dead-band, band gap, with hysteresis, non-smooth non-smooth sandwich observer compared Nonsmooth sandwich construction system successfully resolved the status of multiple non-smooth part of a series of estimation, which the method of the past can not be solved. 4.与传统线性观测器比较，构造的复合非光滑状态估计方法能更准确的估计系统的状态值。  4. Compared with a conventional linear observer, the state value Nonsmooth state estimation method of constructing a more accurate estimate of the system. 图8本发明观测器和传统线性观测器的状态估计误差比较图。  FIG state observer 8 of the present invention and conventional linear observer estimation error comparison FIG. 步骤1:利用关键项分离原则和切换函数，由简单到复杂，借鉴已构建的带死区、带间隙和带迟滞三明治系统非光滑状态空间方程，构建能准确描述含有死区和迟滞的复合三明治系统的非光滑状态空间方程。  Step 1: Using the key principle and a switching function separation, from simple to complex, Reference dead band has been constructed with the gap and with hysteresis Sandwich nonsmooth state space equation, constructing accurate description contains dead zone and hysteresis nonsmooth state space equations composite sandwich system. ci = 0 · 14, C2 = 0 · 12，C3 = 0 · I，C4 = 0 · 08，C5 = 0 · 06，C6 = 0 · 04, C7 = 0 · 02,其中Ci表不第i个间隙的宽度，第i个间隙的输入输出关系如图5所示。  ci = 0 · 14, C2 = 0 · 12, C3 = 0 · I, C4 = 0 · 08, C5 = 0 · 06, C6 = 0 · 04, C7 = 0 · 02, wherein the Ci table is not of a gap width i, the i-th input-output relationship of the gap as shown in FIG. 其中，K2= [0.1 0.1]TeR2xl 是反馈矩阵。  where, K2 = [0.1 0.1] TeR2xl feedback matrix. 实施例中，选取K2= [0.1 0.1]\则（A2-K2C2)的特征值为[0.8000+0.0316i， 0.8000-0.0316i]τ均在单位圆内，根据步骤2中的收敛定理可知，系统的状态估计值最终将收敛到真实值。 Wherein  embodiment, select K2 = [0.1 0.1] \ is (A2-K2C2) value [0.8000 + 0.0316i, 0.8000-0.0316i] τ are within the unit circle, in accordance with step 2 Convergence Theorem It shows that the estimated value of the state of the system will eventually converge to the true value. 其中，A表示转移矩阵，B表示输入矩阵,K1表示增益矩阵，设定线性观测器的增益矩阵Ki=[0 0 0.1 0.1]τ，并给定观测器的初始状态值均为4()) = [2,0.2,0Λ0.02]7',仿真系统的初始值均为X (〇) = [0，0，0，0]τ，采样周期为〇. 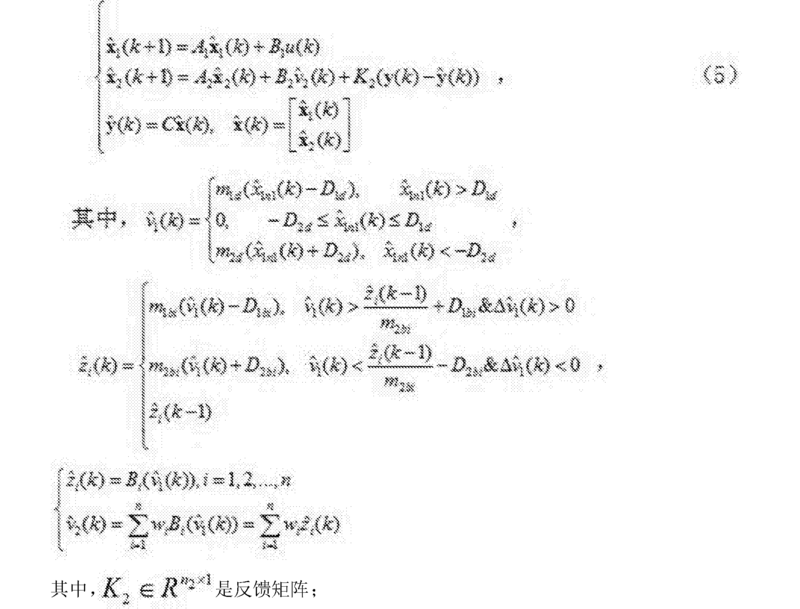 〇1秒，仿真时间为3秒。  wherein, A represents a transition matrix, B represents the input matrix, Kl represents a gain matrix, set the gain matrix of the observer linear Ki = [0 0 0.1 0.1] τ, and to set an initial state value of observer 4 are ()) = [2,0.2,0Λ0.02] initial value 7 ', the simulation system are X (square) = [0,0,0,0] τ, the sampling period is square. 〇1 second simulation time 3 seconds. 由图6可见，本发明的状态估计方法能很好地跟踪系统的实际状态值，获得准确的状态估计值。  seen in Figure 6, the state estimation method of the present invention, the system can track the actual state value, accurate state estimates. 由图7可见，传统的线性观测器无法准确估计系统的X21 (k)和X22 (k)两个状态值。 Seen from FIG. 7, the conventional linear system can not accurately estimate the observer's X21 (k) and the two state values ​​X22 (k). 由图8可见，对于X21 (k)和X22 (k)两个状态，传统的线性观测器估计方法的估计误差要远大于本发明的状态估计方法的估计误差。 It is seen from FIG. 8, for X21 (k) and two state X22 (k), the estimation error of the estimation method of the conventional linear observer estimation error is much larger than the state estimation method of the present invention. 表示后端线性系统的输出矩阵。 It represents a linear output matrix backend system.